The Days of Johann, an agility dog! : Storing stuff! Gracie and I have a lot of stuff - toys, snow boots, jackets, crates, towels, agility equipment, leashes, costumes, collars, grooming supplies - you name it, we've got it. And our stuff ends up all over the house sometimes - leashes in the kitchen, tunnels in the living room, grooming supplies in the bathroom and kitchen. Wouldn't it be nice to have everything organized! Mum was looking around for a neat way to store some of our stuff and found this interesting site. 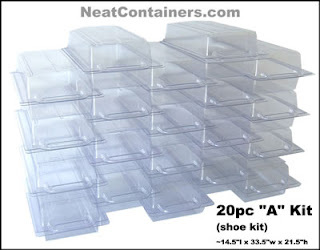 They sell these clear see-through storage containers that you can stack vertically, but use them like a drawer at the same time, without unstacking or collapsing. Oh, we could find a lot of ways to use these - in the garage for our equipment during off season for agility, in the car for when we travel to trials, in the closet to hold all our extra toys, jackets, towels and stuff, and of course our Halloween costumes. And Mum could really use something like this for her closet too, as a shoe organizer, for sweaters, seasonal storage, winter gloves and hats - could even be good for CD's and some of her business stuff. Not a bad idea!